EASTERN GHOUTA, Syria – A surge in violence in Eastern Ghouta since February has forced the evacuation of over 158,000 people, leaving many with serious unmet protection and medical needs. The evacuees have been sent to a number of locations, with some placed in temporary shelters, schools and warehouses not adequately equipped to house people or keep them safe. Many of the displaced people have unmet reproductive health needs – with many having lost access to medical care even before they were forced to flee. “Before they left Eastern Ghouta, there was no electricity, no hospitals, no doctors – the doctors escaped also – so no one could serve them,” said Dr. Hala Al Khayer, a reproductive health expert for UNFPA who visited the shelters and surrounding areas. Displacement has only exacerbated the hardship. 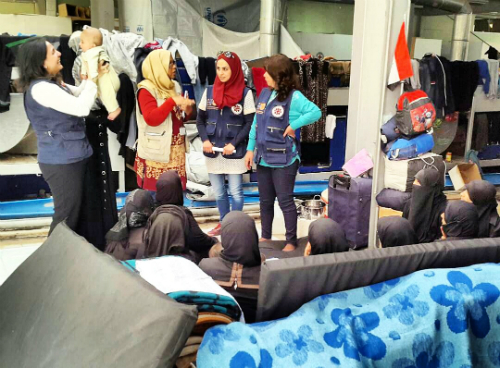 “We met a lot of pregnant women who safely arrived in the collective shelters but face limited medical services,” Dr. Al Khayer added. After she fled her home in Douma, pregnant Om Mehi Eddin was settled in the Fayhaa Al Sham temporary shelter. When the time came, the 36-year-old mother of five gave birth with the help of a UNFPA-supported Syrian Arab Red Crescent (SARC) mobile medical team, who helped her get to a hospital in Damascus. The SARC general health mobile clinic is one of three mobile clinics serving the shelter’s residents. Operated by local partners and deployed with UNFPA support, the clinics address the medical needs of pregnant women as well as other evacuees. The two other clinics – operated by the Monastery of Saint James the Mutilated and the Syrian Family Planning Association– specialize in sexual and reproductive health. “They saved my life and my baby as well,” Om Mehi Eddin told UNFPA communication expert Kinda Katranji. Om Mehi Eddin named her child Sham – one of the Arabic names for Syria. “I called her Sham because I love my country a lot, and hope that peace will prevail soon,” she explained. 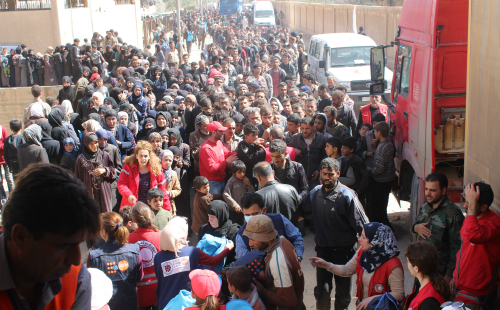 As part of the ongoing response to the humanitarian emergency in Syria, UNFPA and its partners are providing sexual and reproductive health and protection services to Eastern Ghouta evacuees. “UNFPA Syria is on the ground to meet the dire needs and to respond to the rapidly changing situation in the Eastern Ghouta area,” said Mr. Diana. Over 132,800 people in the area have been reached with reproductive health services, including gynecological consultations, family planning, and the distribution of over 115,300 sanitary napkins, including as part of 10,000 dignity kits that also contain other key hygiene items for women and girls. More than 7,300 male dignity kits have been distributed as well. Pregnant women are receiving antenatal care, including supplements and ultrasound diagnostics, referral for deliveries, comprehensive emergency obstetric and neonatal care, and post-natal care. UNFPA and its partners have also reached over 86,400 people with services related to gender-based violence, to raise awareness while providing women and girls with psychosocial support and referral to further health, mental health and legal support. For Om Mehi Eddin, the support, supplies and care provided by UNFPA and partners are making a difference. Once a week, she takes her baby daughter to the UNFPA-supported mobile clinic for a checkup and to receive vitamins and medicine.